Ningaloo Whaleshark ‘N’ Dive’s daily tours offer you the opportunity to go diving with whale sharks in Exmouth on Western Australia’s gorgeous North West Cape, a tropical marine paradise widely considered to be one of the best dive spots in Australia. Our whale shark diving tours are carefully planned by our marine biologists and eco tour experts to ensure all our guests enjoy an amazing experience that deliver memories to treasure forever. So, if you’d like to embark on an exciting tour that will change the way you look at the natural world forever, our tours are perfect for you! As the team receives many requests for information about our popular whale shark interaction tours, we’ve listed and answered some of the most popular FAQs here. While we’ll provide you with as much information about our tours as we can, unfortunately, we’re unable to tell you what it’s like to get up close with a whale shark – it’s something so amazing, it just can’t be expressed with words! Are There Any Age Restrictions to Go Swimming with Whale Sharks? No, there aren’t any age restrictions. As long as you can swim, you can snorkel with a whale shark. Our boat is specifically designed so that everyone can experience this amazing, once in a lifetime opportunity. The marlin board – the board you use to enter and exit the water – sits level with the water and is fitted with two big dive ladders to make our boat extremely easy for people of all ages to get on and off. When Is the Best Time of the Year to See Whale Sharks? As whale sharks are seasonal travellers, following their food sources to tropical waters north and south of the equator, they can be seen in Exmouth from March through to July each year with the best sightings from April to the end of July. If you go swimming with whale sharks from May to July on a Ningaloo Whaleshark ‘N’ Dive tour, you may also have the chance to swim with manta rays and see humpback whales on their northern migration. The whale sharks we swim with here on the Ningaloo Reef range in length from 2 – 10 metres, with the average sighting on our tours being sharks around the 5 – 6-metre range. The biggest whale shark recorded was measured at a massive 12 metres and weighed over 21 tonnes, however, these remarkable marine creatures have been sighted by fisherman at over 18 metres in length! What Features Does the Tour Boat Offer? Our whale shark diving tours are conducted north of Perth on our purpose-built dive vessel, ALIIKAI, which has recently undergone a major refit. With four showers, two toilets, two easy-to-use dive ladders and comfortable seating for everyone on the tour, you’ll find it’s a feature-packed vessel with everything you need. Did we forget to mention that it’s been outfitted with brand-new dive equipment, including seven underwater scooters and two SUP (Stand Up Paddle) boards? How Close Can I Get to Them and Can I Touch Them? To protect these gentle giants of the ocean, a code of conduct has been put in place by the Department of Environment and Conservation to ensure the safety and wellbeing of both swimmers and the whale sharks. This means we’re allowed to swim a distance of 3 metres from the side of the head and body and 4 metres away from the tail when in the water with these massive creatures. 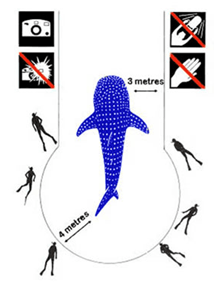 No human contact with the whale sharks is allowed as this would put you within the 3m and 4m rule and we are not allowed to swim in front of them. How Long are the Tours and What’s Included? Our whale shark tours are all-day tours departing at 7:30 am and returning between 4:00 – 4:30 pm. Included in the price are all DPAW fees, transfers from your accommodation (Exmouth area only), all meals and hot/cold drinks (including a gourmet buffet lunch and barista morning coffee), whale shark spotter planes, use of all dive and safety equipment, hot showers and a gift bag upon return. Do You Have an Ecotourism Policy? Yes, Ningaloo Whaleshark ‘N’ Dive is eco-certified under Eco Tourism Australia’s Eco Certification program. That means we’ve undergone a rigorous self-assessment process to make sure we meet a range of specific criteria addressing ecotourism principles which is then verified by an independent assessor from Eco Tourism Australia. As marine biologists and avid nature lovers, we operate whale shark interaction tours with the utmost care taken to protect our beautiful marine environments. Do You Have a No Sighting Policy for Your Whale Shark Tours? Yes, we do. As whale sharks and other marine creatures are wild animals with seasonal migration patterns and aren’t coerced or encouraged to interact with humans, they can be unpredictable and in rare instances, Ningaloo Whaleshark ‘N’ Dive may be unable to locate them. Although it’s unlikely that you won’t see a whale shark on our tours, we have a no sighting policy in place that offers two options to suit most guests’ circumstances.